The leg of our collective journey that was calendar year 2014 has brought us to a place that is very different than where many thought we would find ourselves as 2015 begins. As with every year, last January pundits and economic soothsayers peered into their crystal balls to “enlighten” us and give their guidance as to what we should expect for the coming year. And just like a guess when flipping a coin, some of the predictions came true while many proved to be complete misses and entirely off target. One of the most noticeable misses that came from last year’s season of forecasts is something that has begun to impact most of us and our household budgets in a very meaningful way. Instead of oil selling for more than $100 per barrel at the end of the year as many predicted, West Texas Intermediate crude finished the year below $54 per barrel. The sudden and steep decline in the price of oil during the second half of the year represented a decline in the price of oil of more than 45% since the intra-year highs of June. The most directly felt impact of this shift for most of us pertains to how the price of one gallon of gasoline fell by almost 40% nationally and now sells for less than $2 per gallon in many places. With gas at its lowest levels since 20091, and at prices more than 50% lower than they were as recently as the summer of 2013, filling up your tank at the pump isn’t quite as painful as it once was. But what’s good for some, is bad for others. Broadly measured by the S&P 500 index, US large cap stocks provided investors with a 13.7% return for the calendar year 2014. Within that broad index are many companies in the energy sector that do business in the oil and gas industry. Unlike for consumers of oil, the aforementioned price move was not a boon for their bottom lines, but rather a sharp cut to their earnings and share prices. While all other sectors posted positive returns for the year (utilities was the highest at 29%) the energy sector was down almost 8%. Before anyone quickly concludes that avoiding oil companies would have insulated them from losses, it’s important to note that the WilderHill Clean Energy Index that tracks companies doing business in solar, wind, water and other alternative energy sources was down more than 15% for the year. The variation, or dispersion, of sector returns within a single broad index like the S&P 500 may lead some people to question whether diversification is something that they should actually seek in their portfolios. If one sector of the market beats another by 37%, why not try to pick the winners and avoid the losers? A similar question was asked by many this year with regard to a globally diversified portfolio of stocks. Given the relative strength of the US stock market recently, after outperforming a broad measure of international stocks four out of the last five years, some have begun to question whether they should have any international stocks in their portfolios at all. It’s sometimes said that history doesn’t repeat itself but it does rhyme, and to address this question, we don’t have to look too far back in our history to see a Dr. Seuss-like story in the data. The question about whether to invest in a total world equity portfolio was also posed quite often in the middle part of the 2000s. 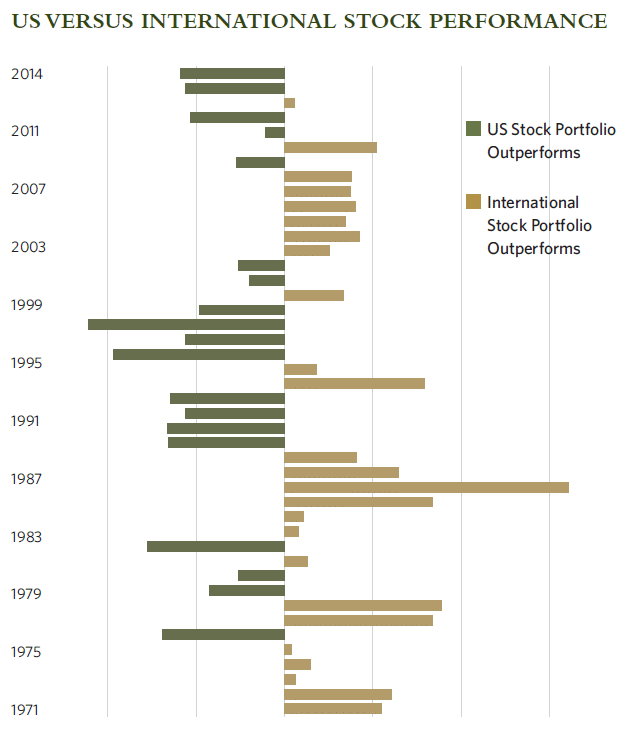 The chart below shows the year-by-year winners of this international performance matchup. When the bar is on the left of the line it means that US stocks did better and when it’s to the right of the line it means that international stocks outpaced their peers. With a quick examination of the data, you may likely conclude that the question investors asked then was not about whether or not to abandon international stocks, but rather, if they should own US stocks at all. After six straight years of lagging behind our international peers, it looked as though a shift had occurred that forever would keep the US trailing the up and coming emerging market countries and the Eurozone with its ever-strengthening collective currency acting like a tailwind for returns. Now, just a few short years later, with a struggling recovery from the Global Financial Crisis and with the dollar strengthening fiercely against most other major currencies, what once appeared to be a sure thing looks like an uncertain choice at best. So what is an investor to do? Data represents past performance. Past performance is no guarantee of future results. Chart is for illustrative purposes only. US stock returns are based on data from the S&P 500 TR from 1971-2014. International stock returns are based on data from the MSCI EAFE GR for 1971-1987, and from the MSCA ACWI Ex-USA GR for 1988-2014. When evaluating the effectiveness of an investment strategy, one first has to understand the goal it’s meant to address. The argument for diversification is not that it provides an outcome designed to maximize short-term returns, rather it focuses on spreading out risk so that any one portion of a portfolio can’t disproportionately take down the rest. By shifting a portfolio’s allocation back and forth from one asset class to another with the hopes of hitting it big, you’re taking on the risk that you miss out completely on the returns that stock ownership provides. Relying on a forecast for the future and the expectations that events will unfold exactly as they seem like they will with uncertain information, ignores the fact that the future is by definition unpredictable and unknowable. Looking back through the data to see how differing strategies have fared in the international guessing game, we can see that no crystal ball is necessary to reap the rewards of a strong investment strategy. One can plainly recognize the benefits of diversification in the table below; by balancing out risk and spreading the allocation of an equity portfolio across the globe, an investor enjoyed a higher total return that carried lower risk than by investing solely in either of the component parts. Data represents past performance. Past performance is no guarantee of future results. Chart is for illustrative purposes only. US stock returns are based on data from the S&P 500 TR from 1971-2014. International stock returns are based on data from the MSCI EAFE GR for 1971-1987, and from the MSCA ACWI Ex-USA GR for 1988-2014. The globally diversified portfolio is made up of 2/3 US stocks and 1/3 international stocks assuming quarterly rebalancing. Risk represents annualized standard deviation of monthly returns. Lastly, one must take into account more than just past returns when examining how to invest for the future. Although an imperfect forecasting tool, company valuations provide us with useful information about future returns and a method to measure the relative price that we’re paying for one investment versus another. As of December 31st, 2014, US stocks had a forward price to earnings ratio (P/E) of 16.42 while developed market stocks were less richly valued at 14.2 and emerging market stocks were at 11.0. These figures don’t guarantee future outperformance, but they do offer insight that attractive opportunities continue to lie outside our borders. The data reinforces what CCM’s investment approach and your integrated plan already adhere to with regard to discipline and diversification. However, when a year begins and we are again flooded with news headlines that claim to accurately forecast what will happen in the coming year, it bears reminding ourselves why we maintain the discipline of remaining globally diversified—even when one component (US or International) outperforms the other for consecutive annual periods.